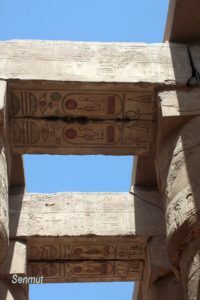 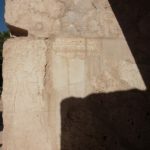 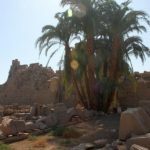 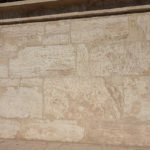 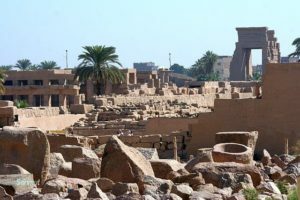 The Karnak temple in fact is built from the inside out, and we find the oldest part in the centre, the Holy of Holies, built by Thutmoses 1. 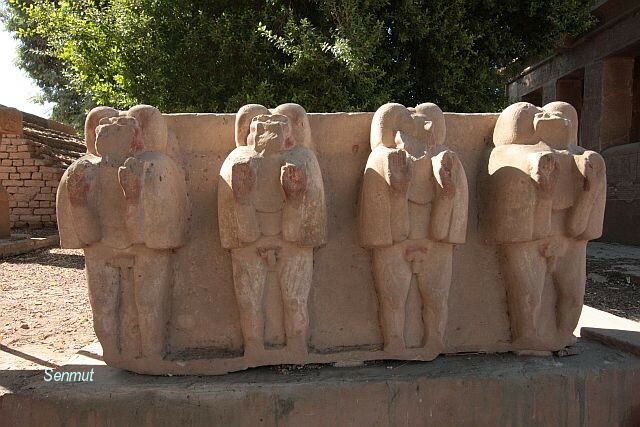 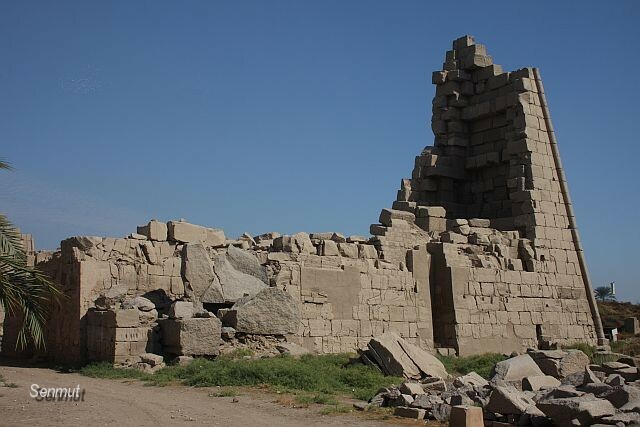 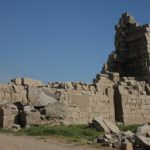 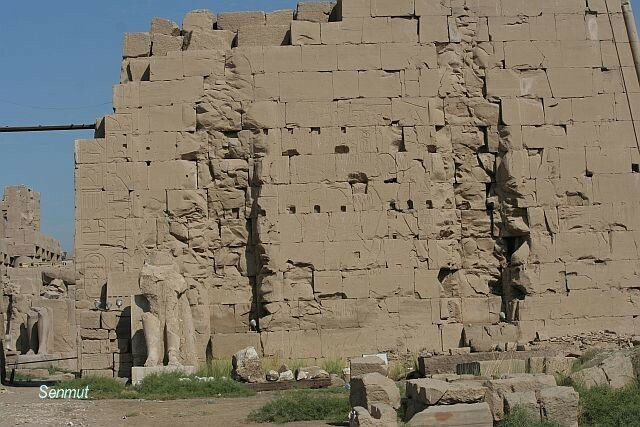 There are older parts, but just foundations have been found, the buildings probably were destroyed by the Hyksos. 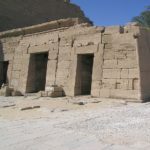 The temple was dedicated to Amon, but in fact is for the triad Amon, Mut and Chonsu. 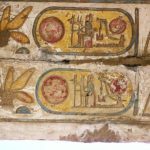 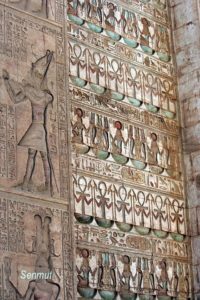 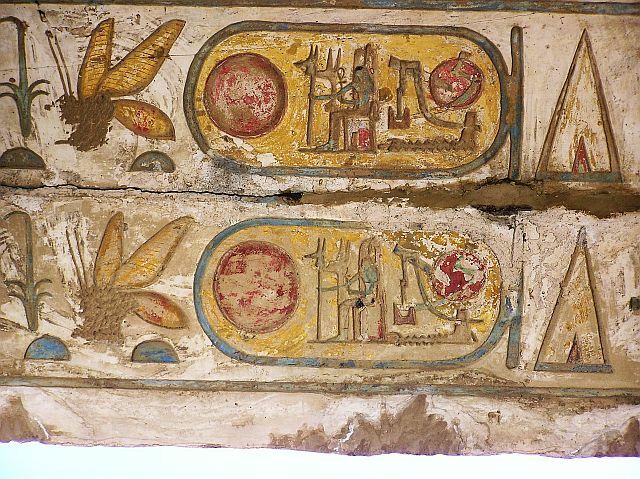 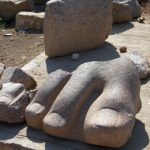 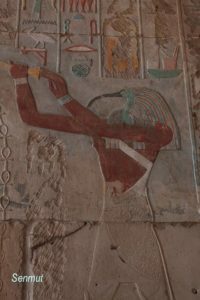 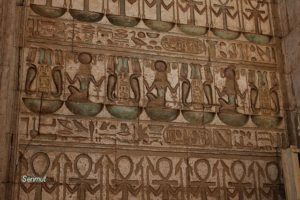 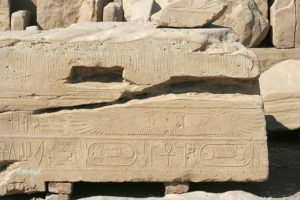 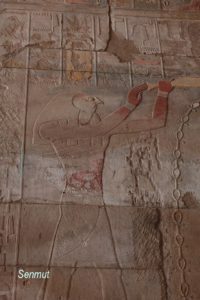 It is certain now, that the temple was founded probably under the reign of Mentuhetep Nebhepet-Re, the first farao of the 11th dynasty. 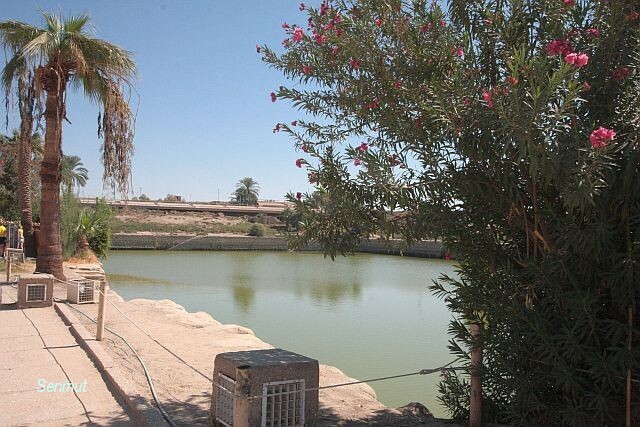 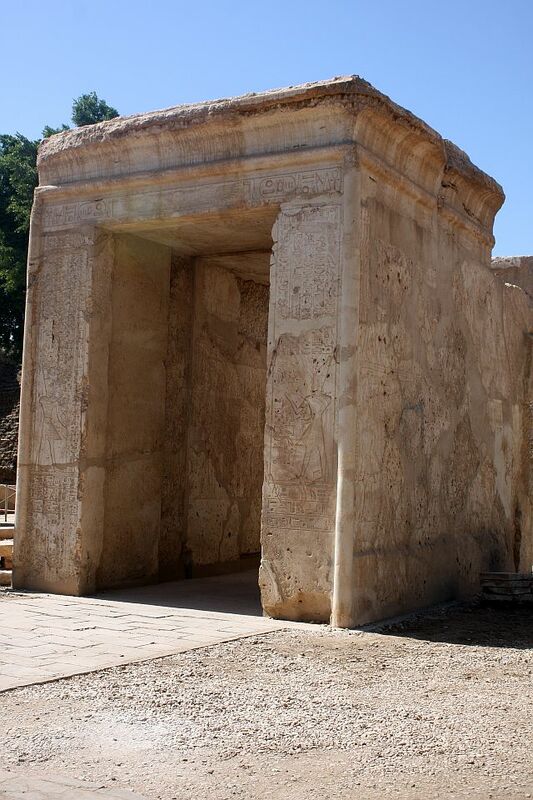 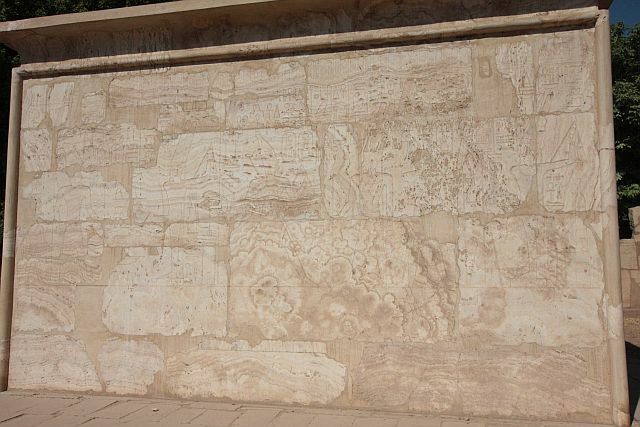 Foundations of the older temple were found in the area between the sanctuary and the Festival temple of Thutmose III. 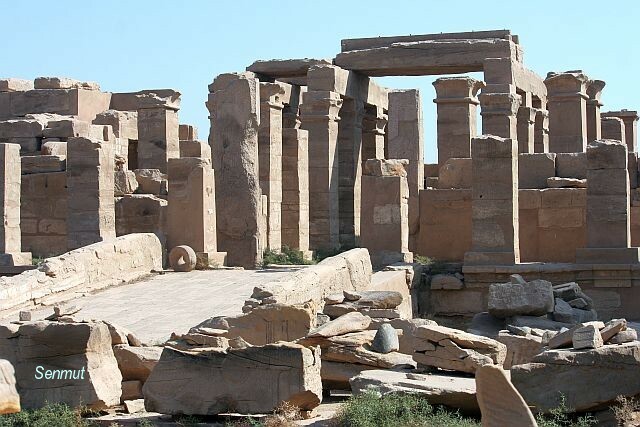 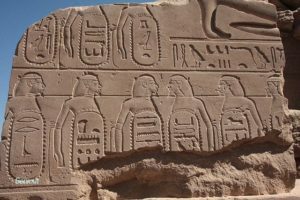 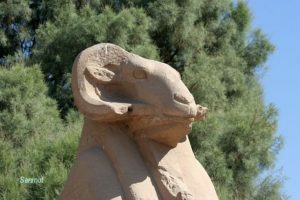 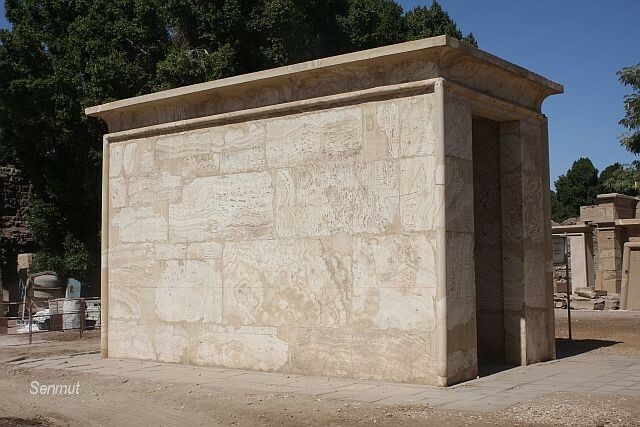 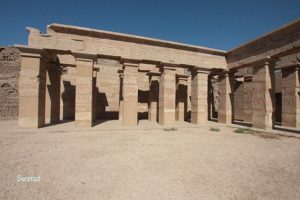 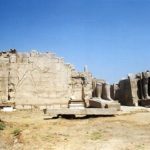 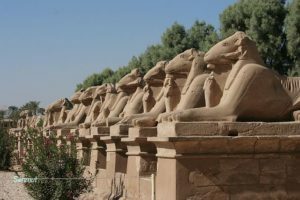 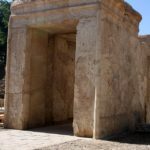 The temple in its present form dates from the the beginning of the 18th dynasty, a small alabaster chapel of Amenhetep I is the only remaining part from this period, which now can be seen at the Open Air museum. 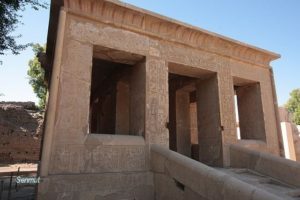 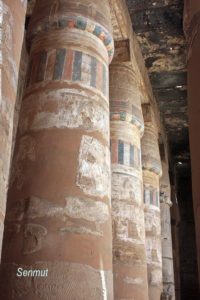 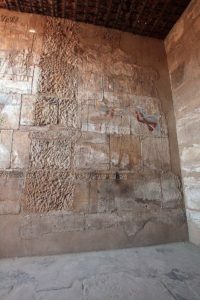 The real building activities started by Thutmose I and especially his daughter Hatshepsut, who took it as her duty to restore all the temples and sanctuaries, destroyed by the Hyksos. 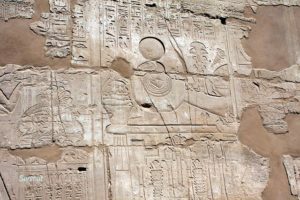 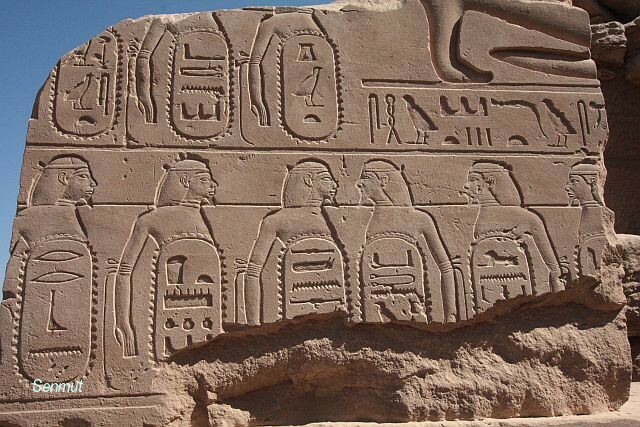 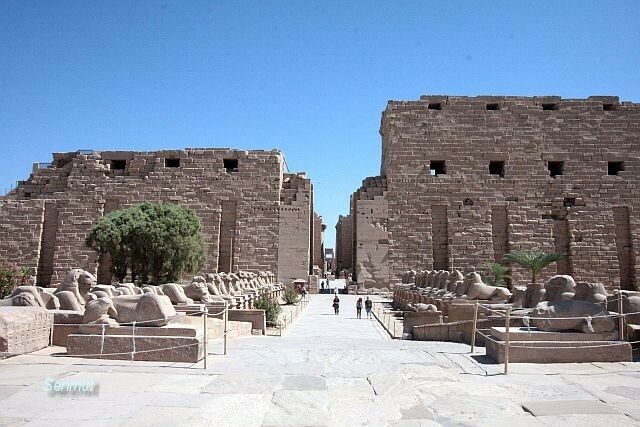 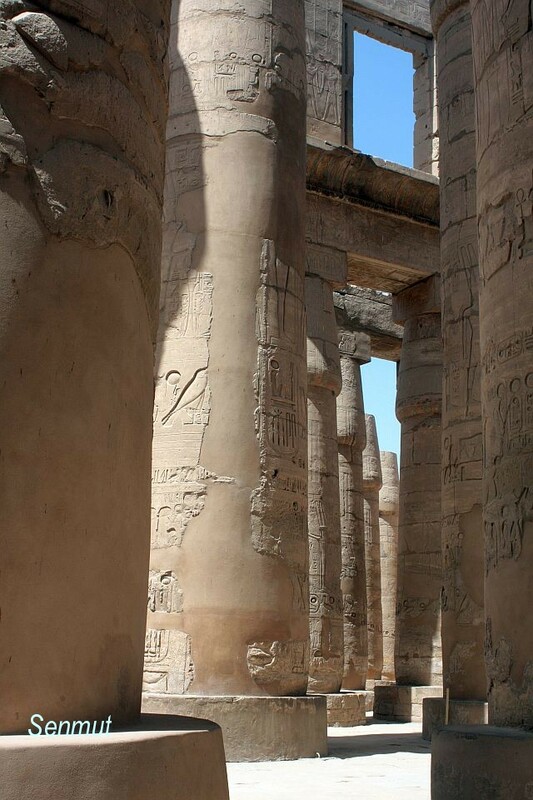 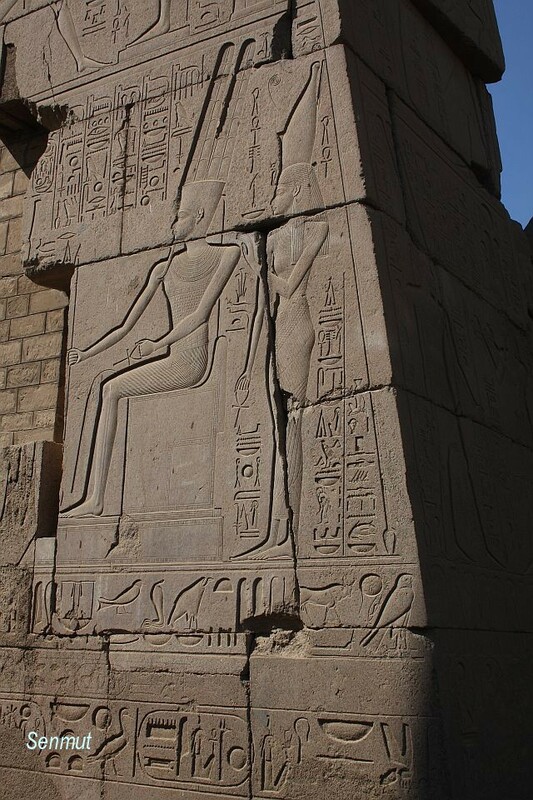 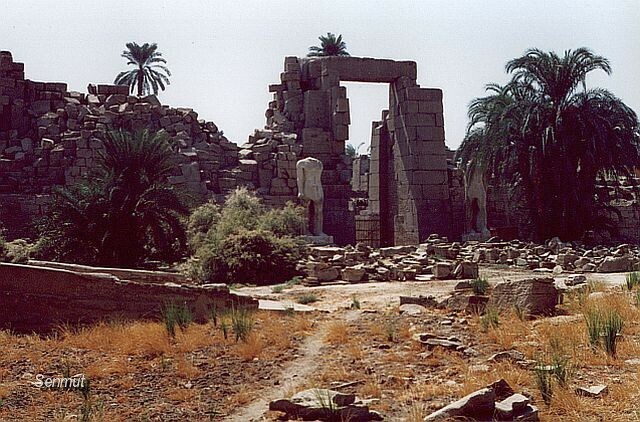 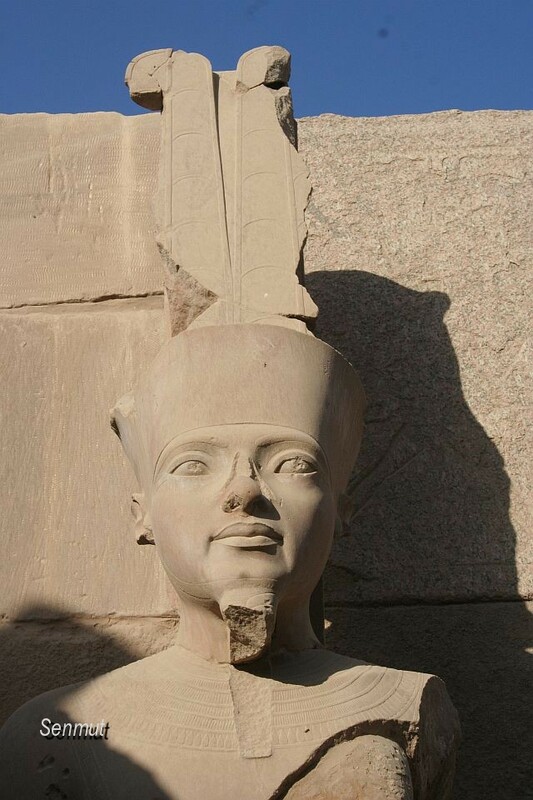 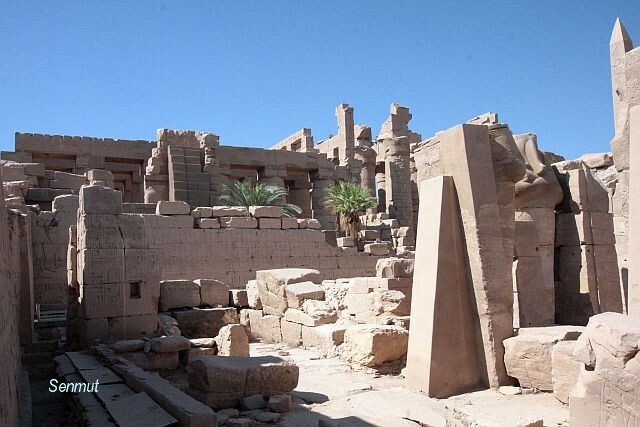 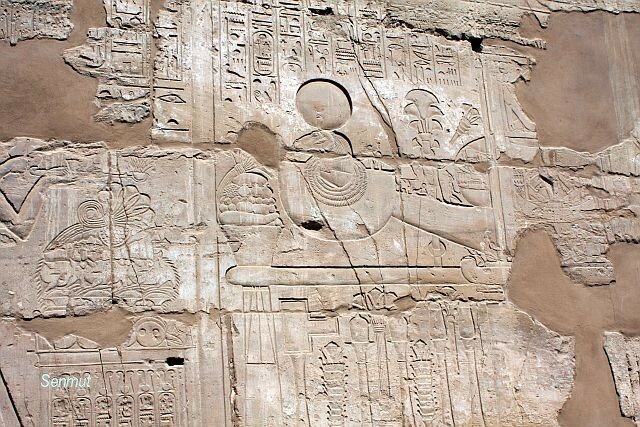 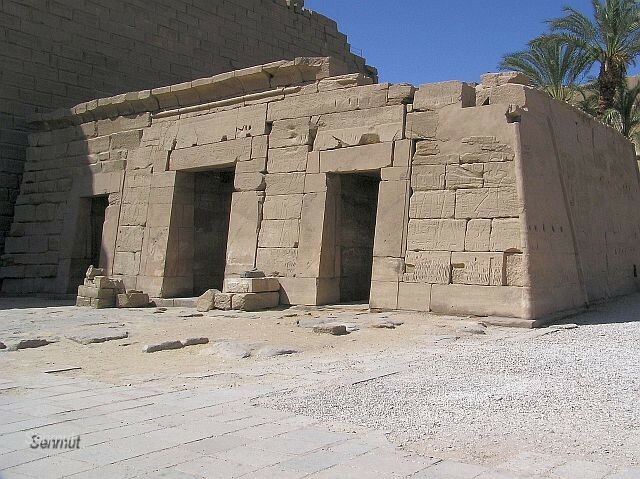 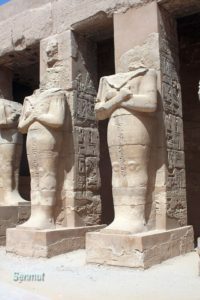 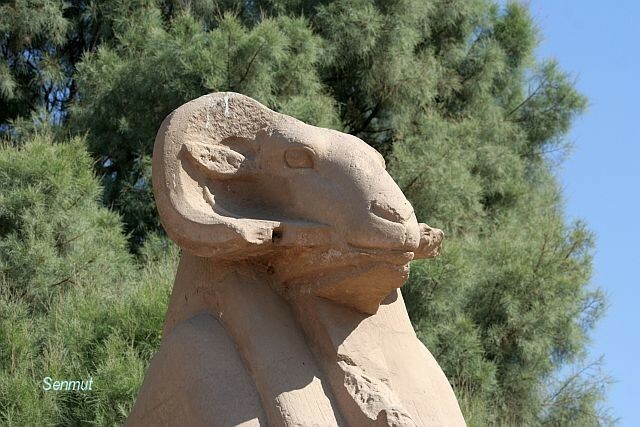 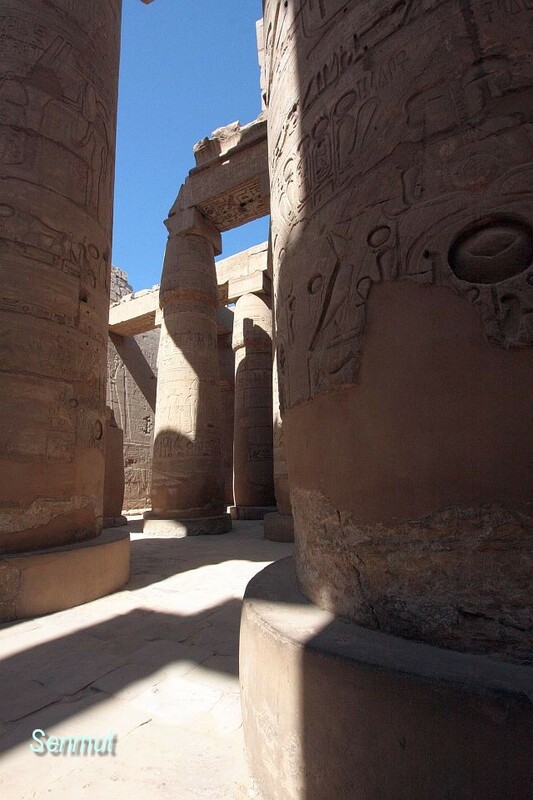 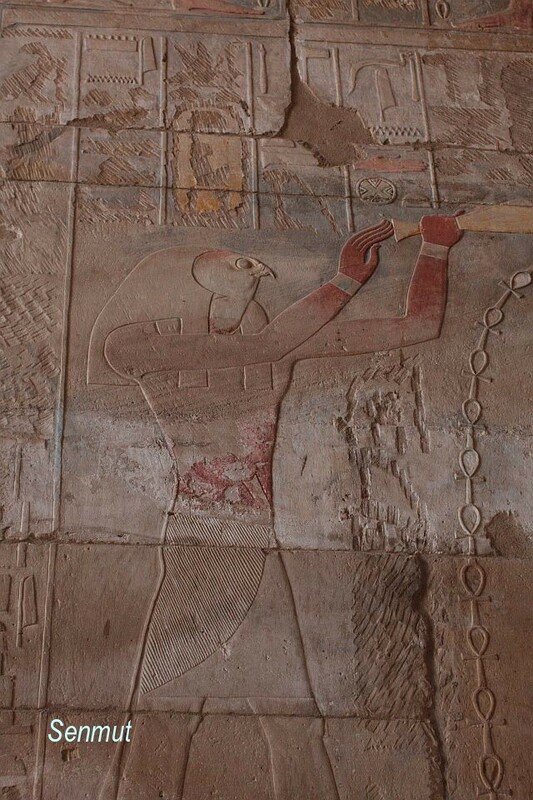 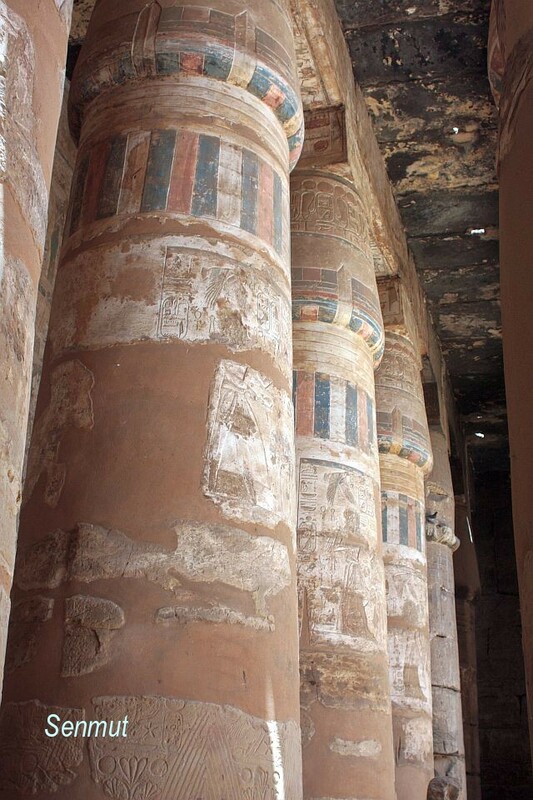 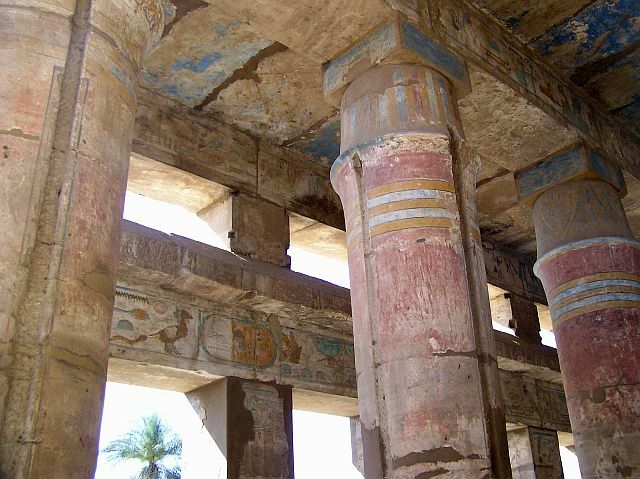 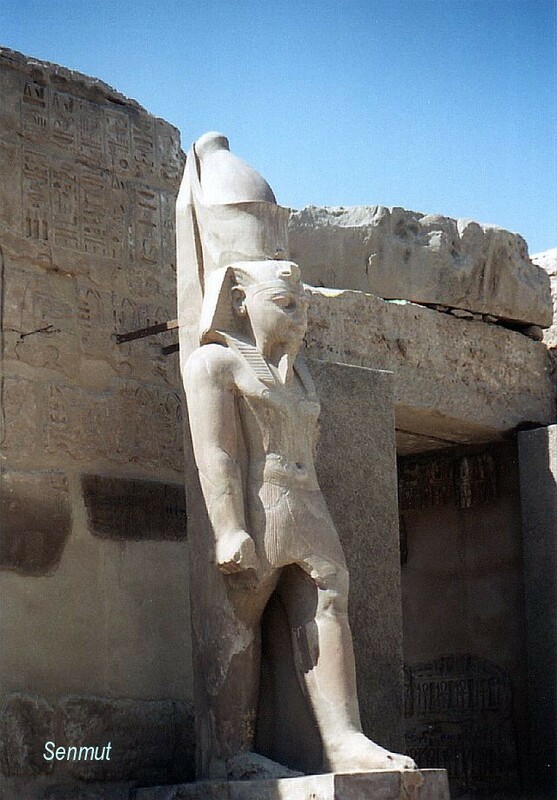 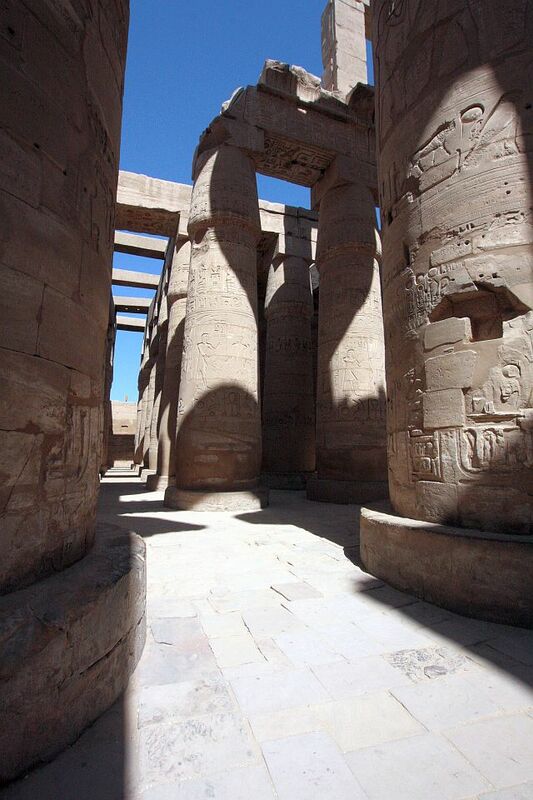 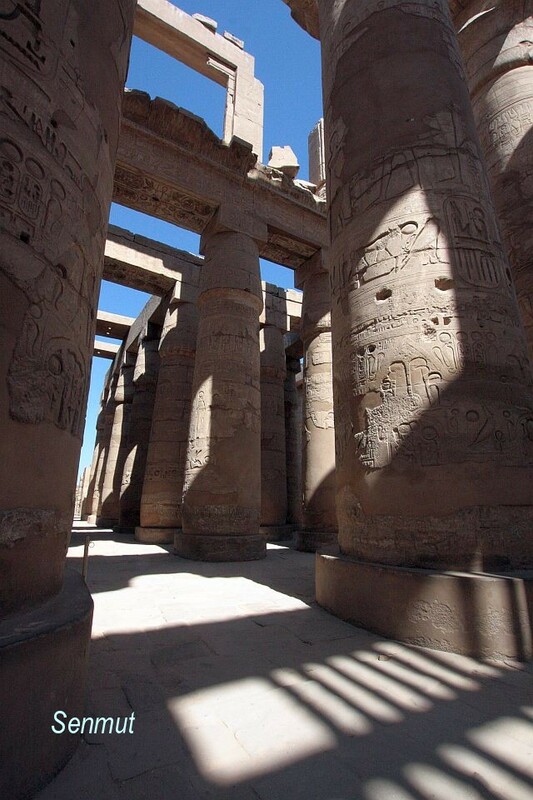 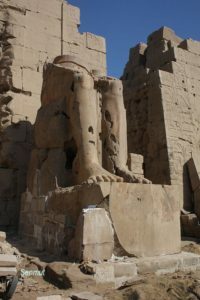 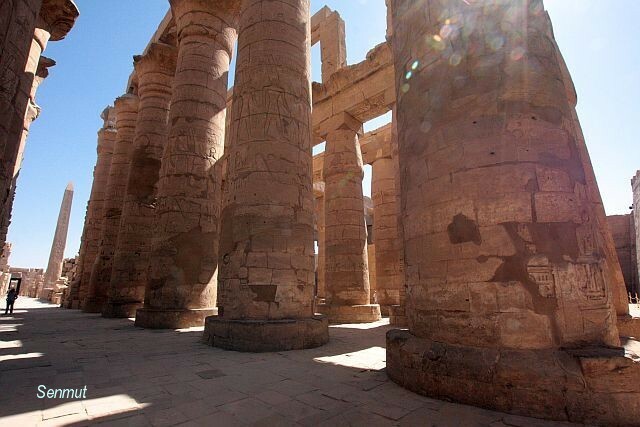 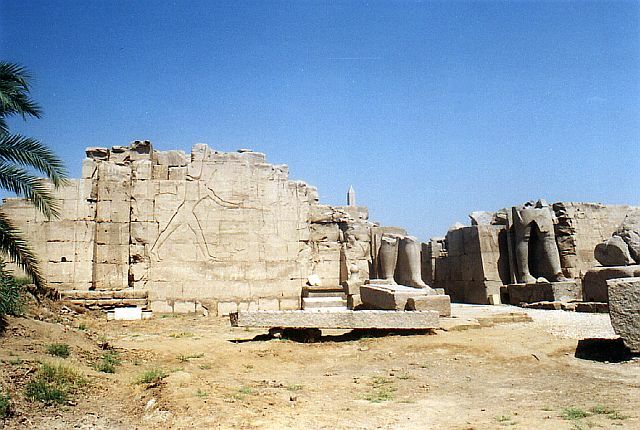 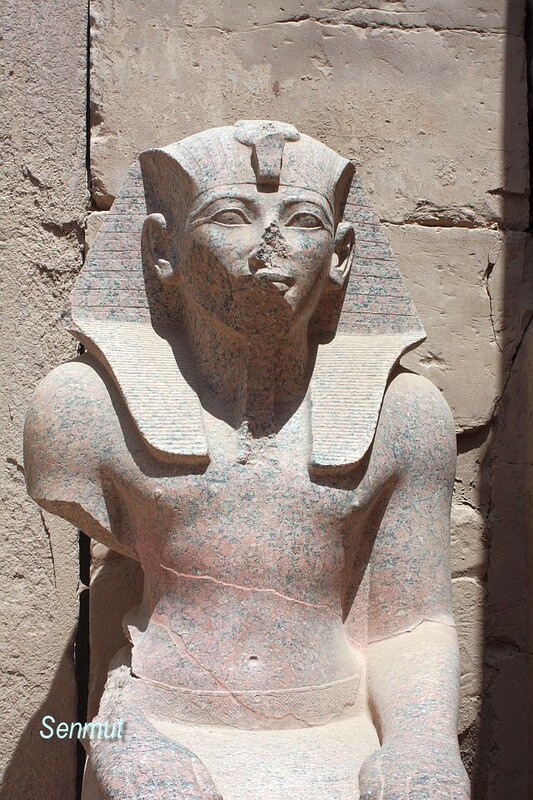 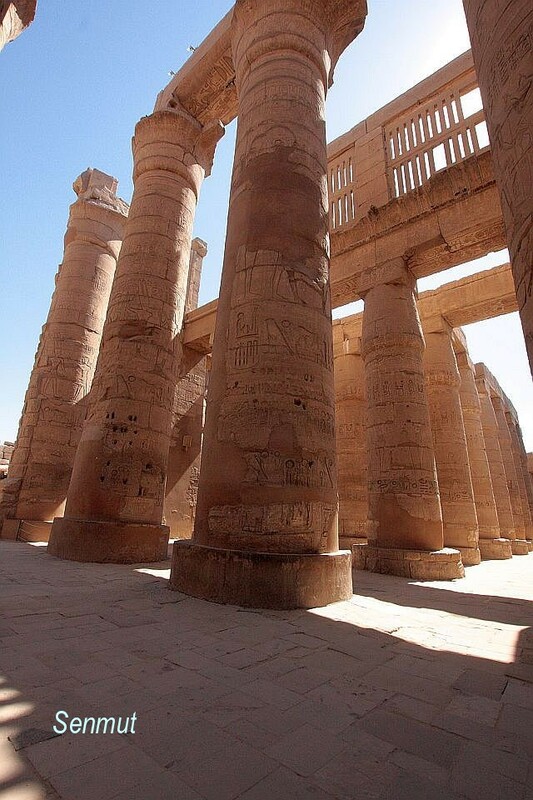 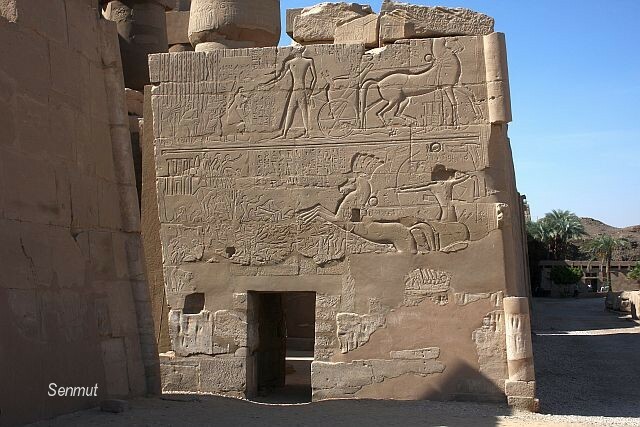 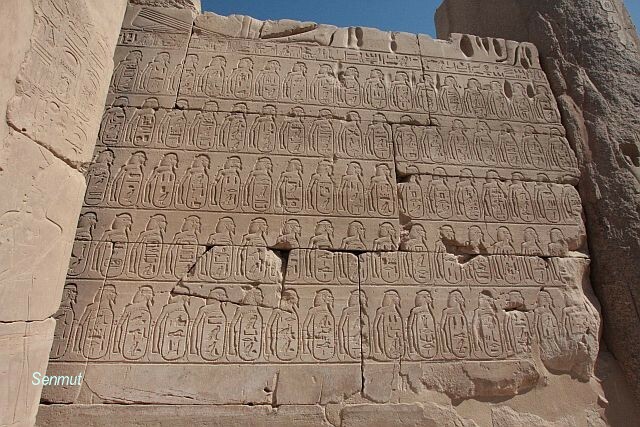 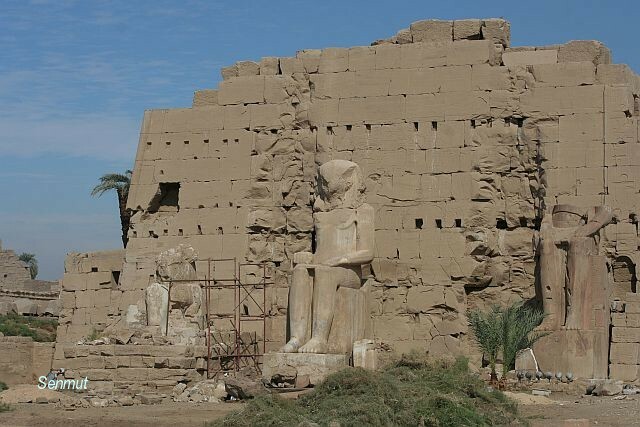 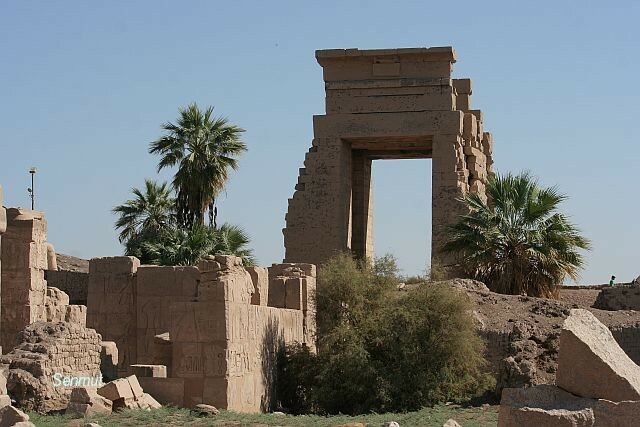 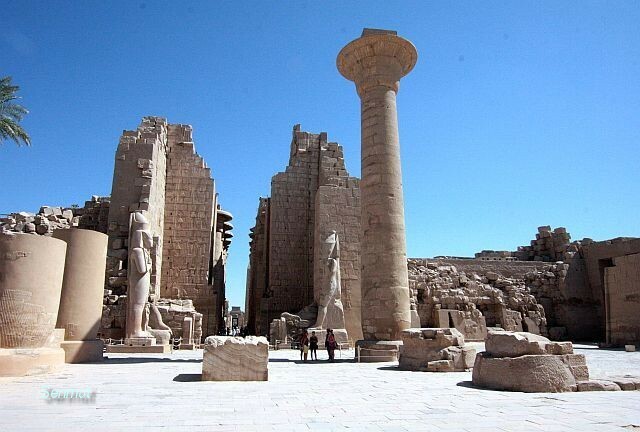 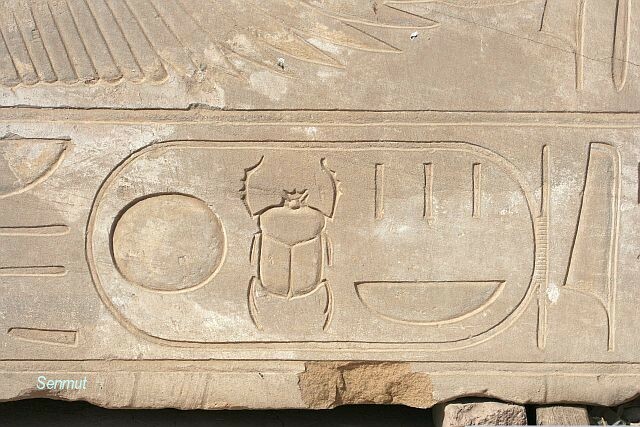 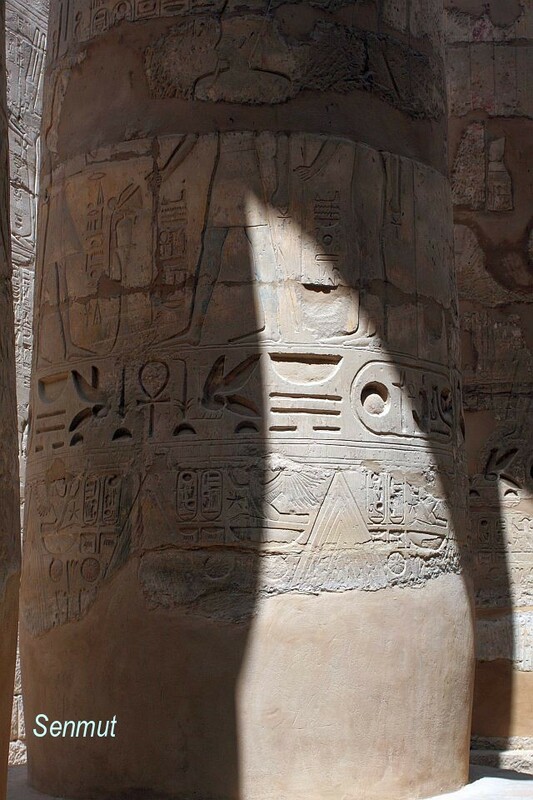 At the reign of Seti I and hid son Ramses II developed the temple finally to its present form. 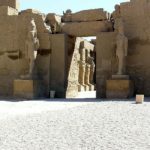 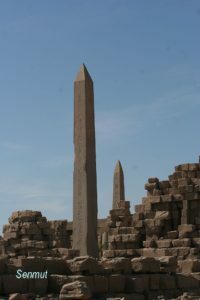 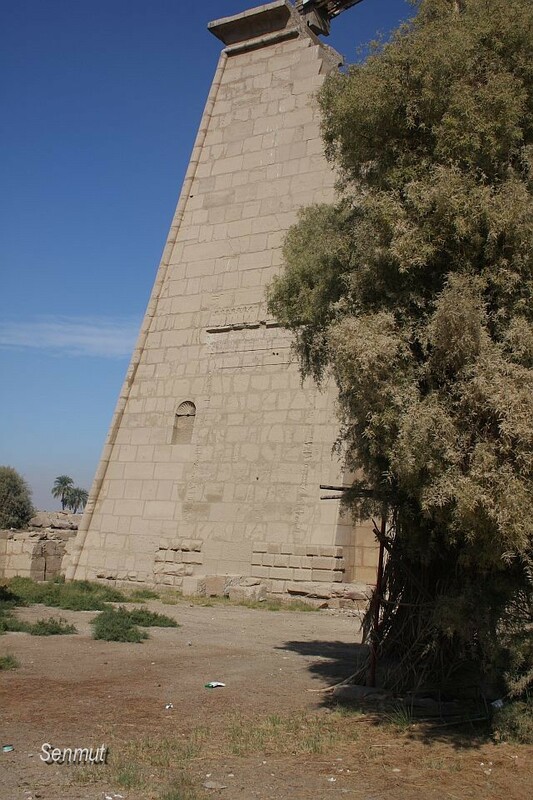 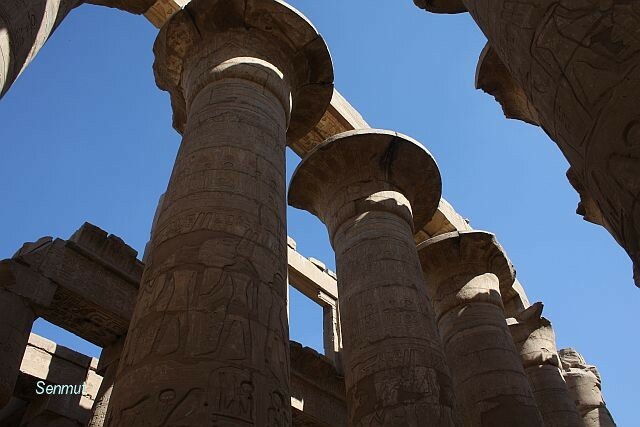 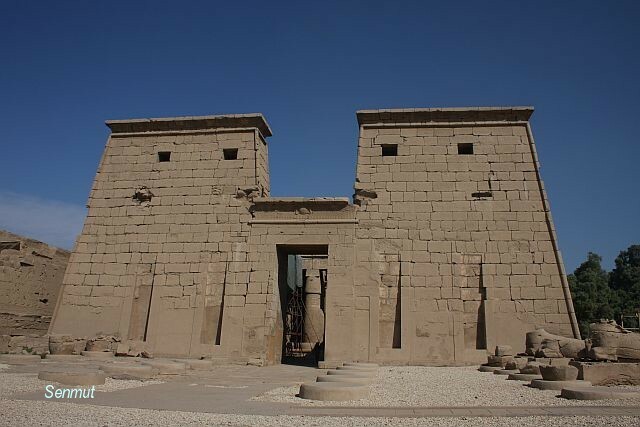 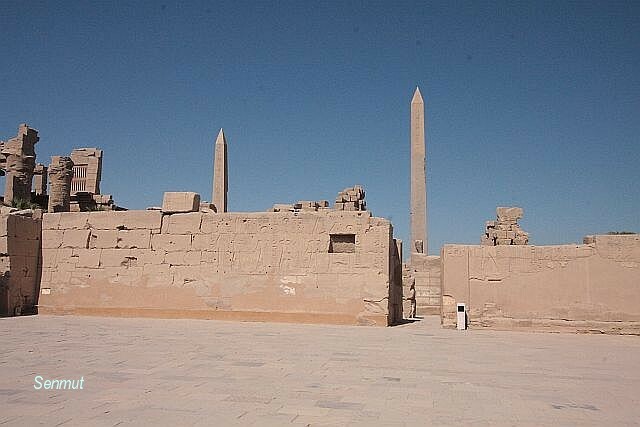 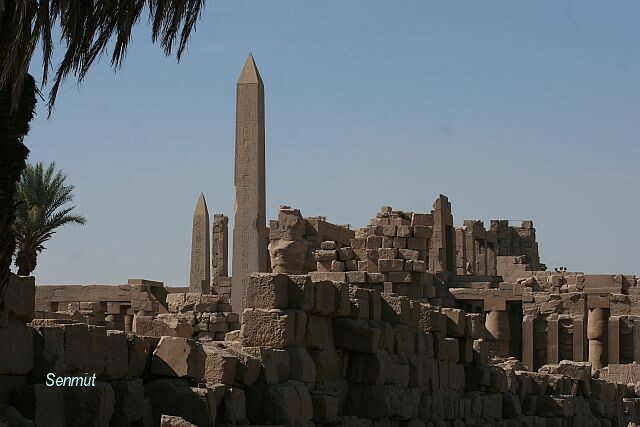 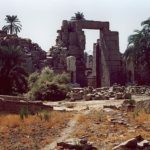 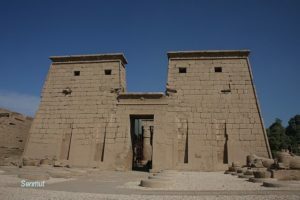 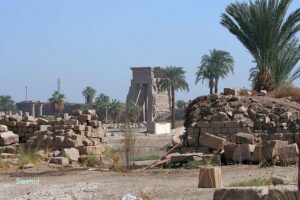 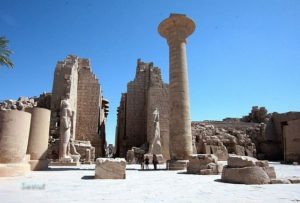 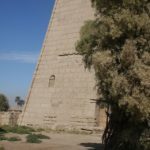 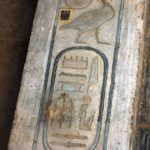 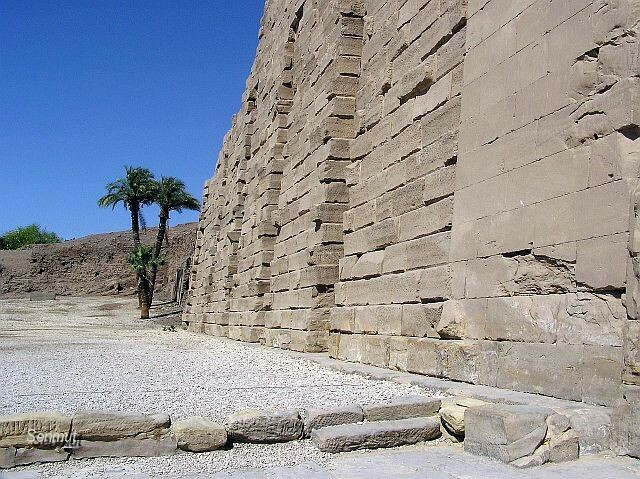 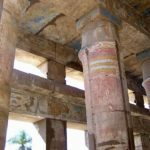 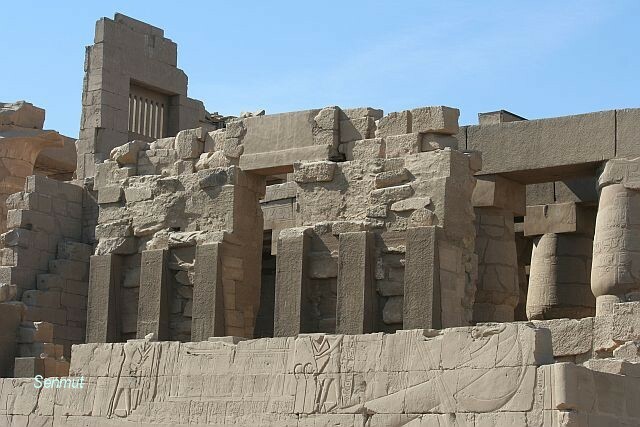 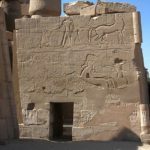 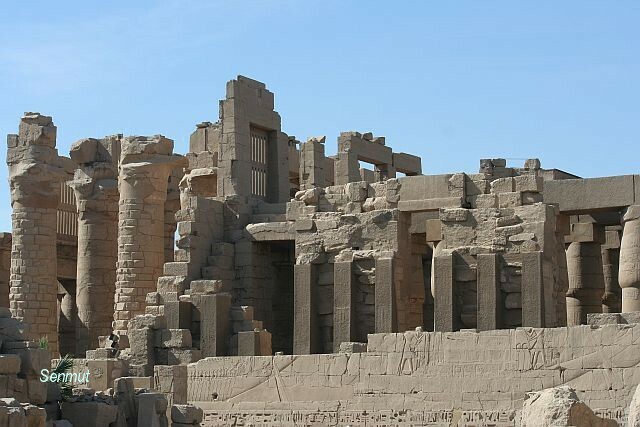 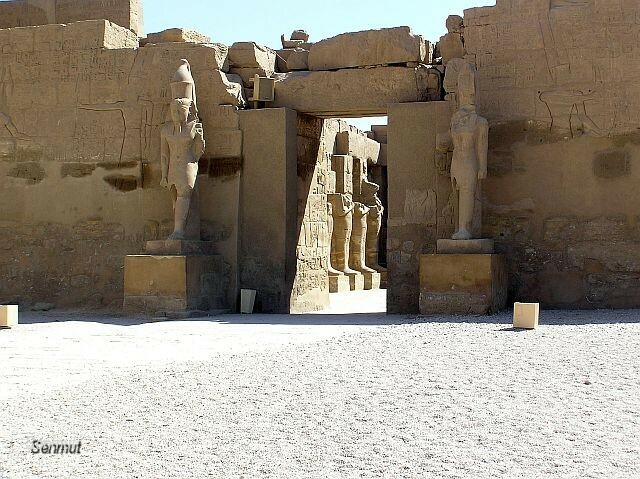 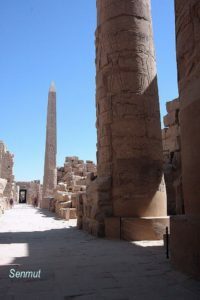 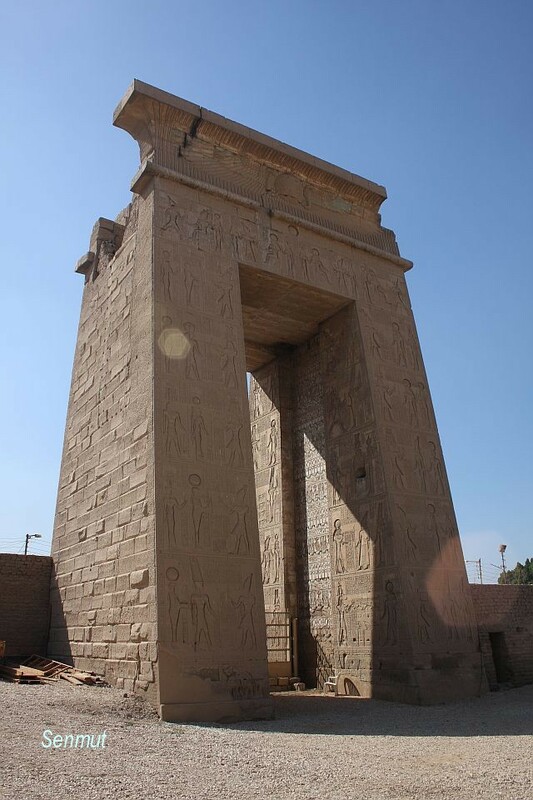 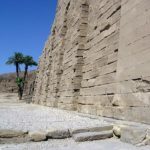 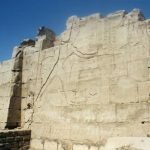 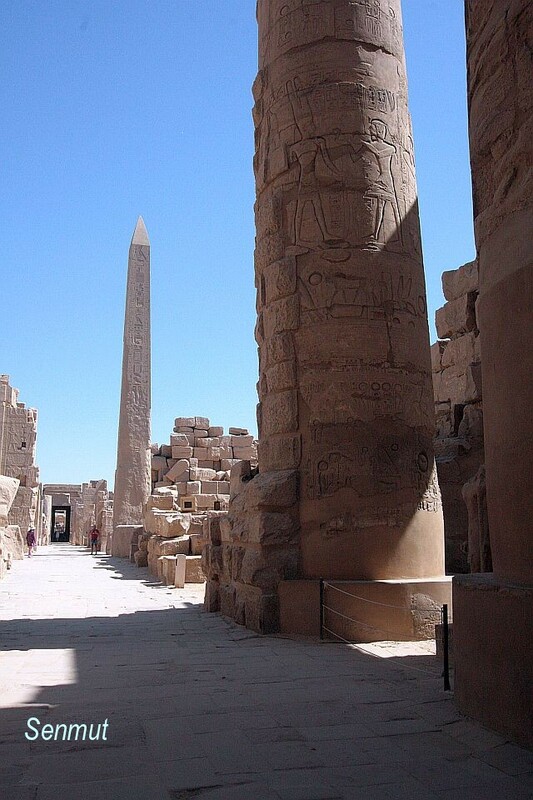 Although they built the center part of the temple with the sanctuary and obelisks, the Thutmose family decided to extend the temple between the 3rd and 4th pylon to the south in the direction of the Luxor temple, by adding the 7th and 8th pylon. 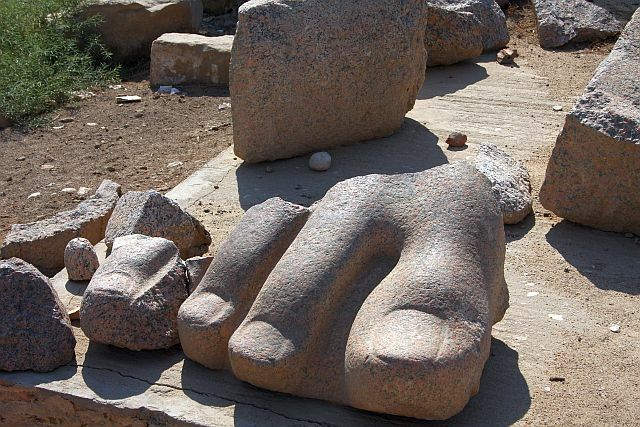 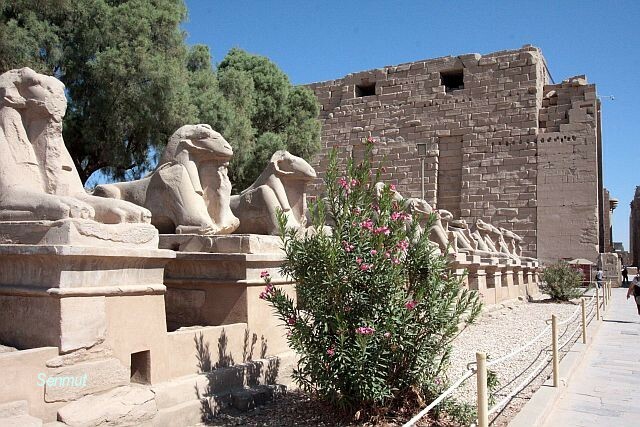 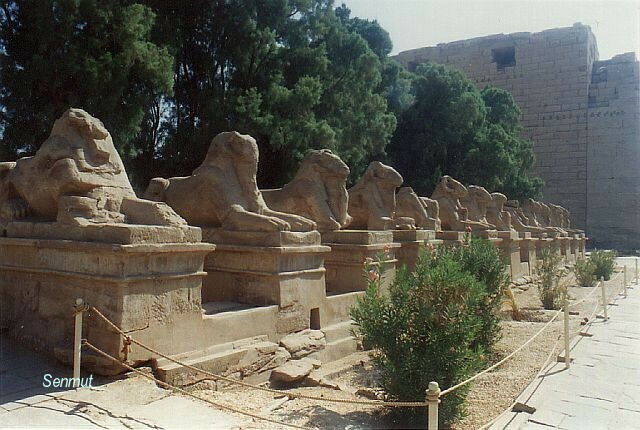 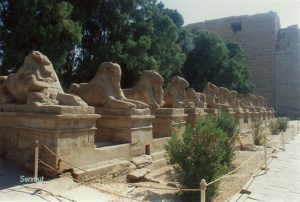 From the 10th pylon a sphinx alley is leading to the temple of Mut, which now lays outside the karnak area. 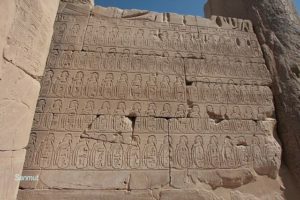 Seperate we find 2 other temples, Mut at the North area and Chonsu at the South. 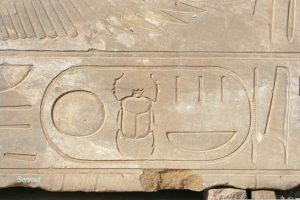 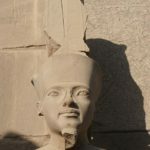 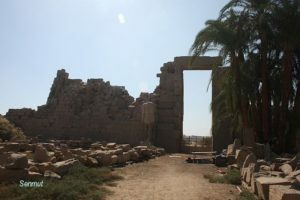 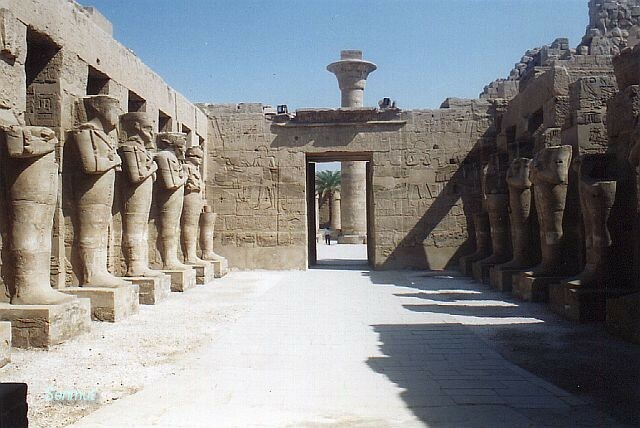 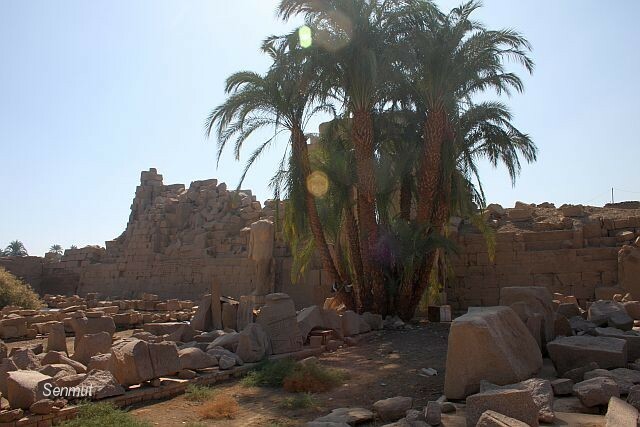 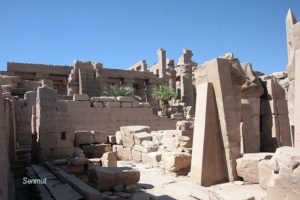 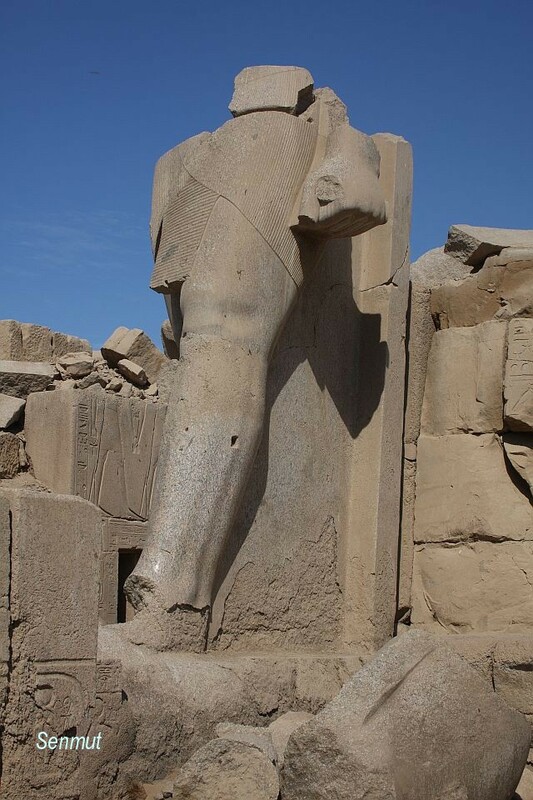 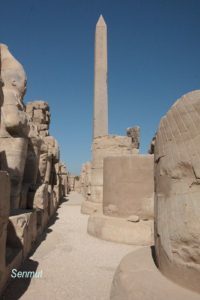 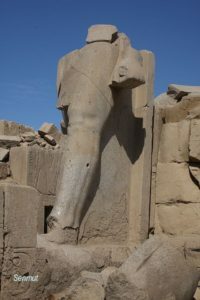 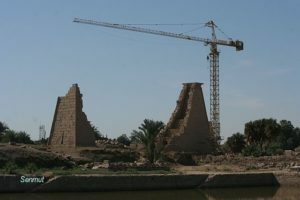 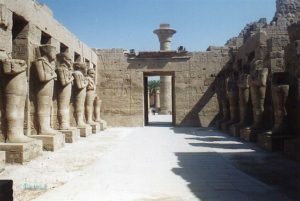 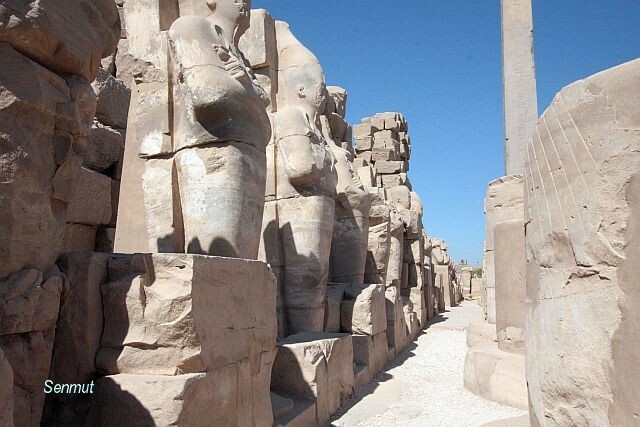 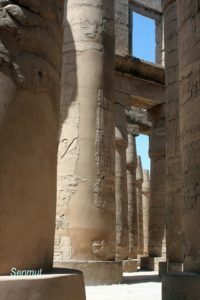 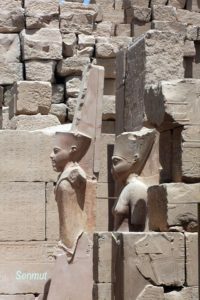 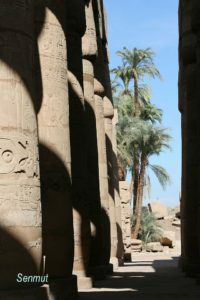 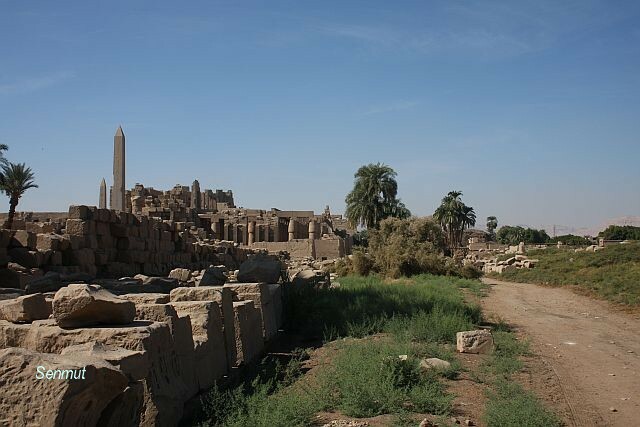 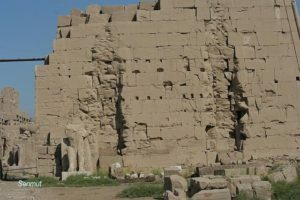 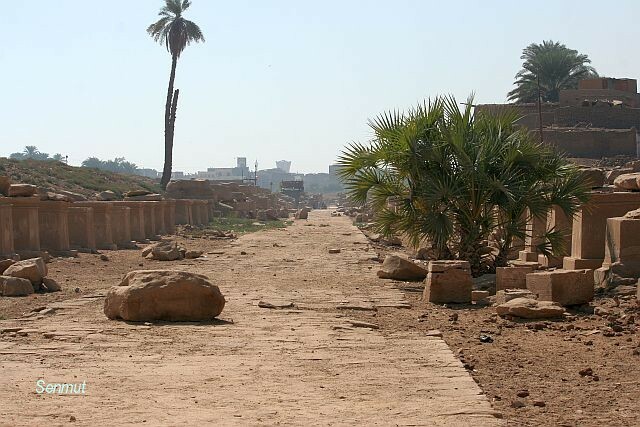 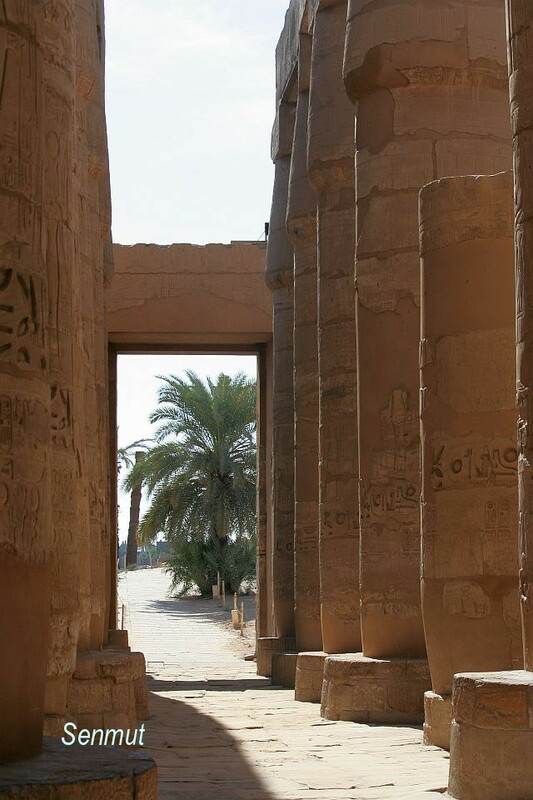 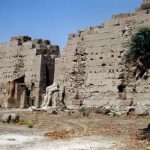 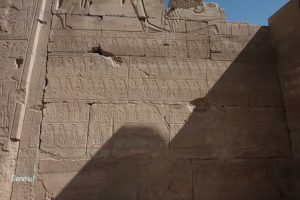 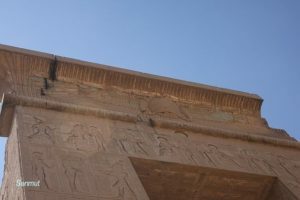 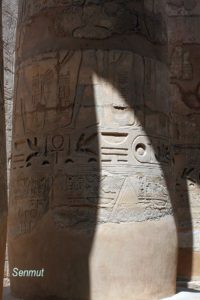 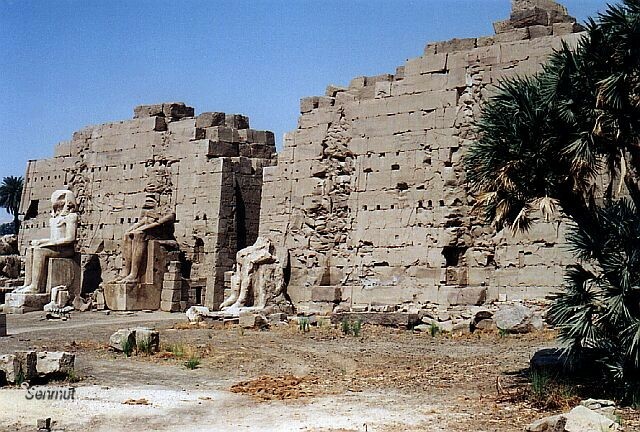 In early days, both the temples of Luxor and Karnak were connected by an alley of sfinxes, of which still a large part can be seen running through Luxor city. 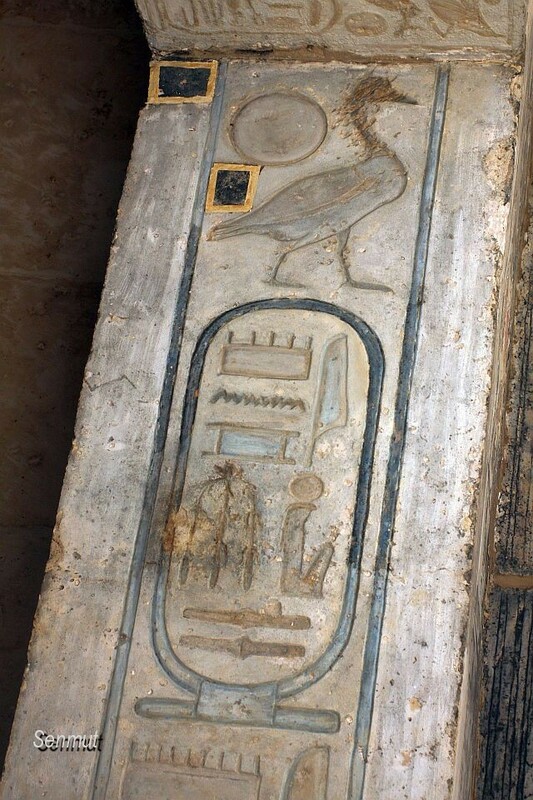 Pylon IX of Horemheb, the restoration stopped, because the inner blocks appear to be those of Ankh-en-Aten, being reused by Horemheb.Pylon IX of Horemheb, the restoration stopped, because the inner blocks appear to be those of Ankh-en-Aten, being reused by Horemheb. 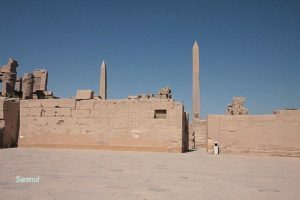 View from the rear of the Hypostile hall with the two obelisks.View from the rear of the Hypostile hall with the two obelisks. 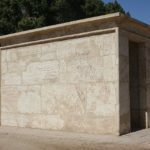 White chapel of Sesostris at the Open Air museum.White chapel of Sesostris at the Open Air museum. 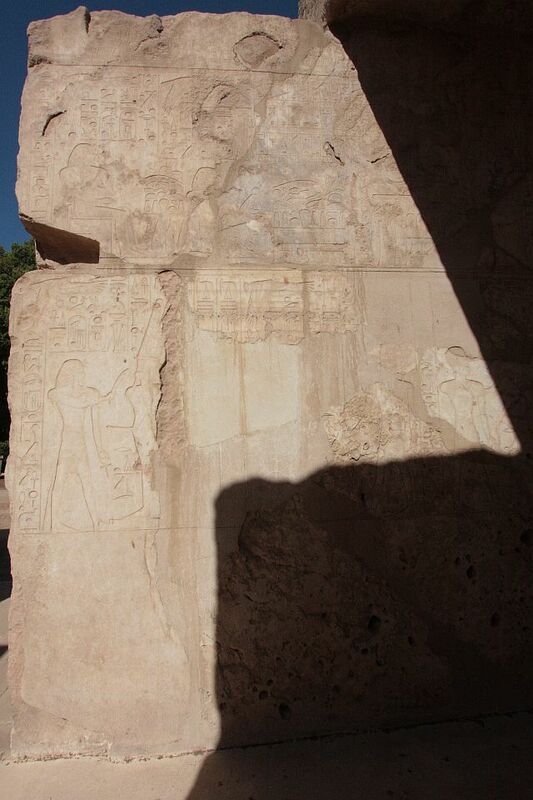 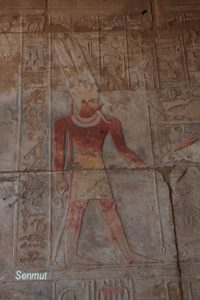 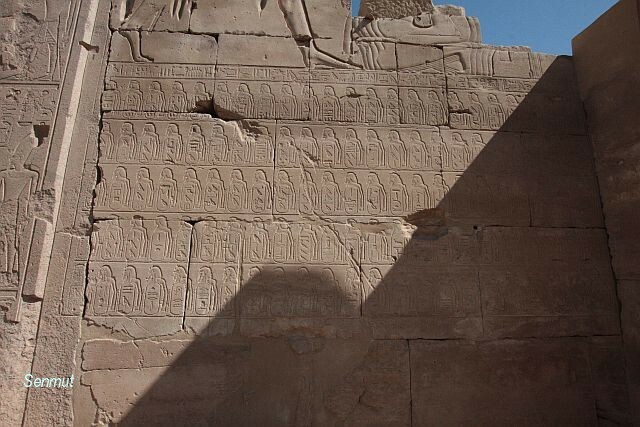 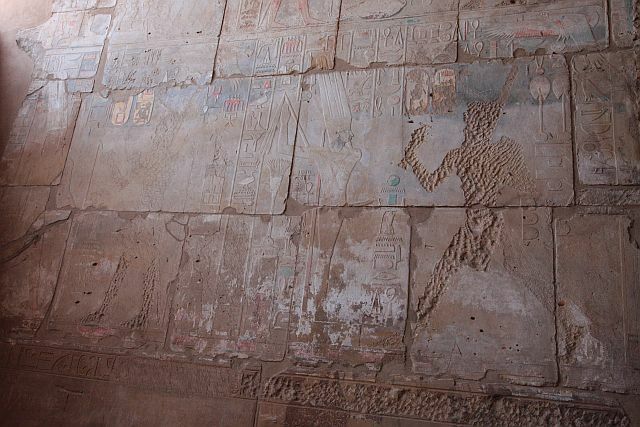 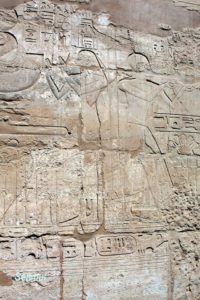 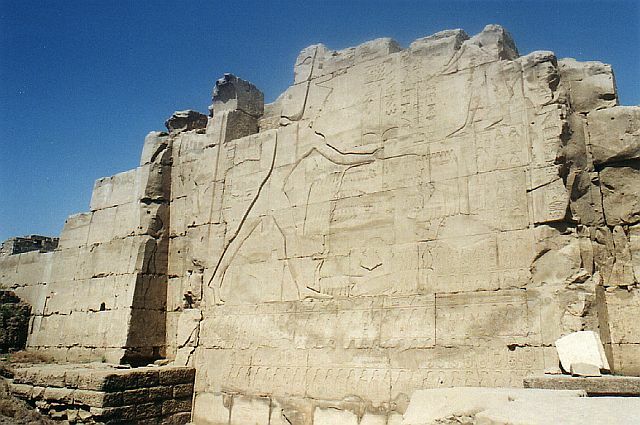 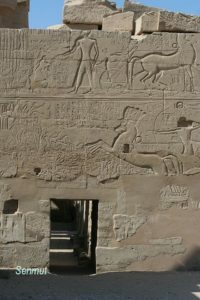 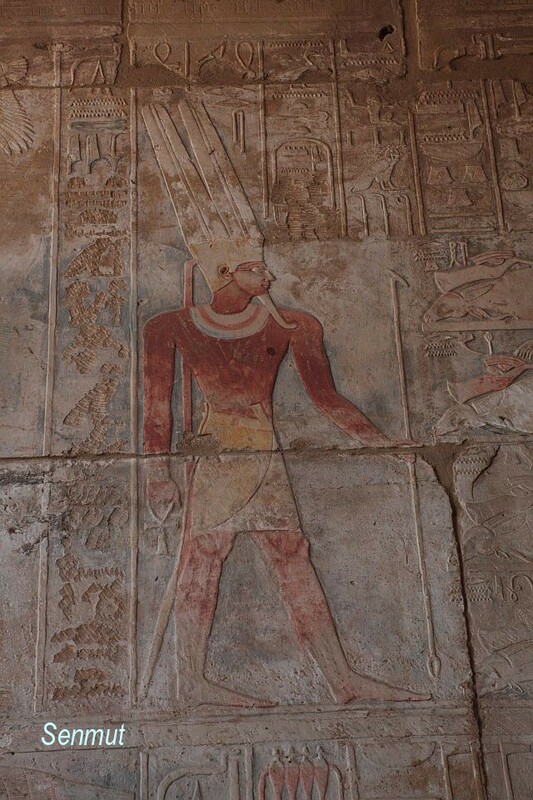 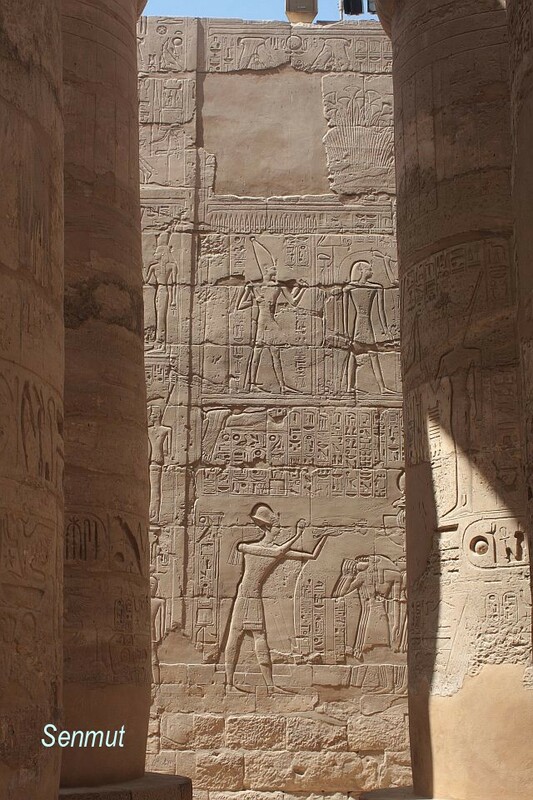 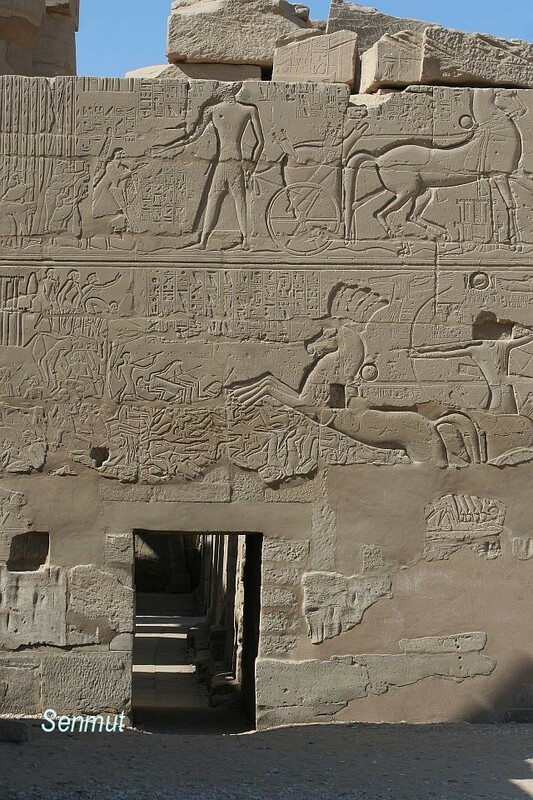 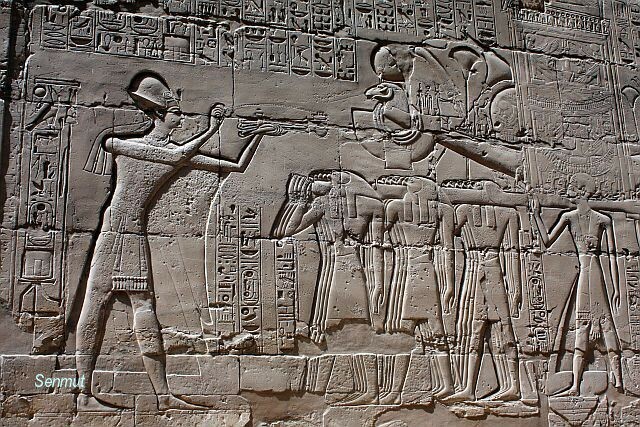 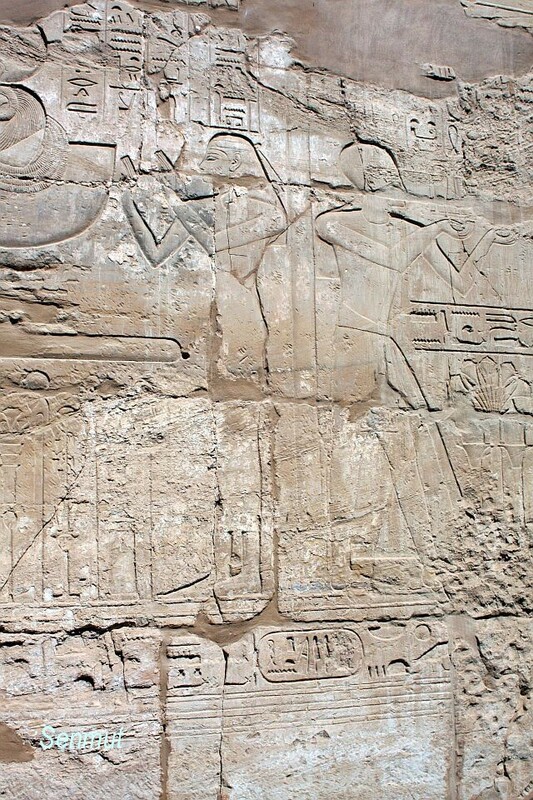 The 7th pylon with scenes of the farao Thutmose III, grandson, smiting his enemies. 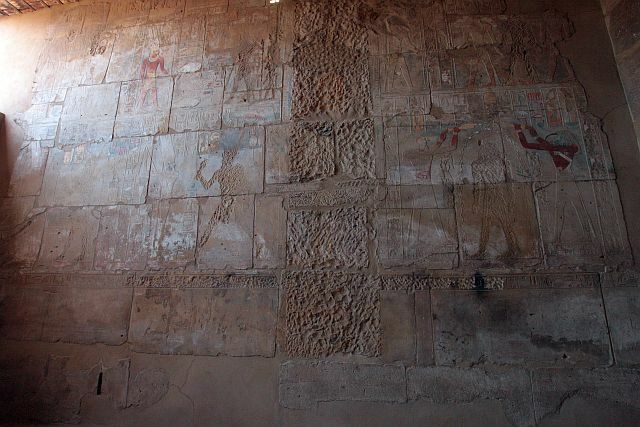 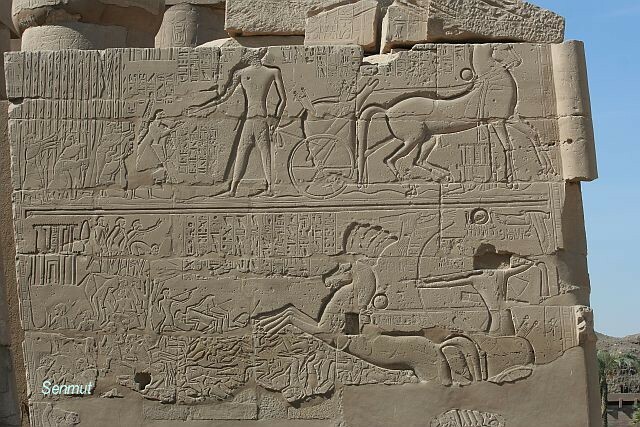 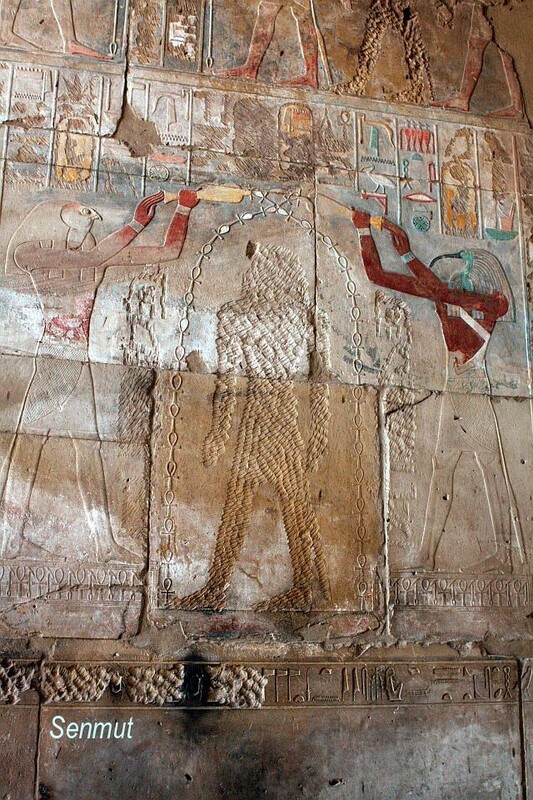 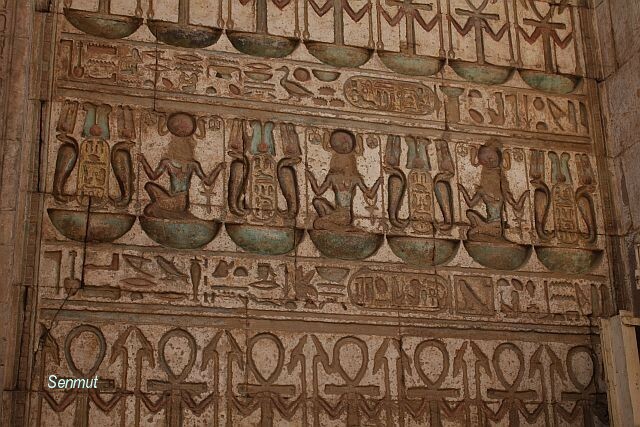 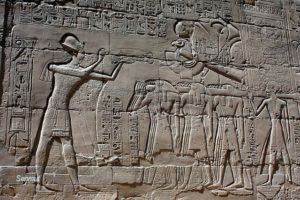 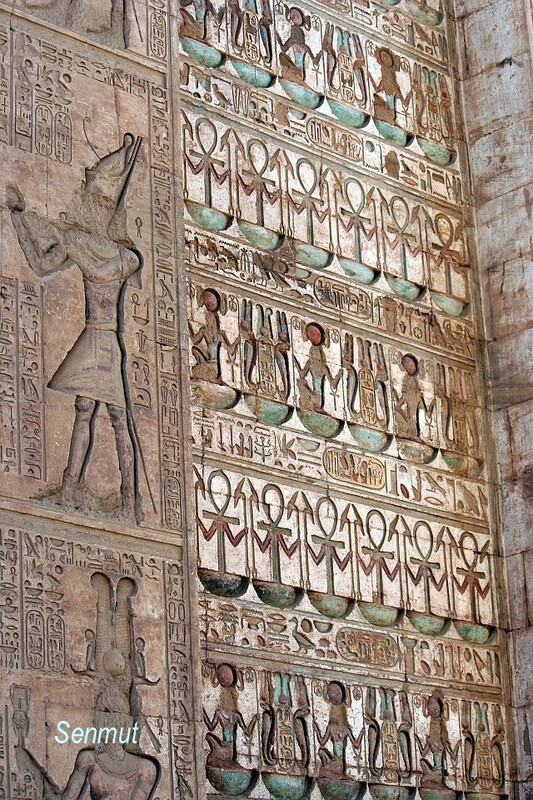 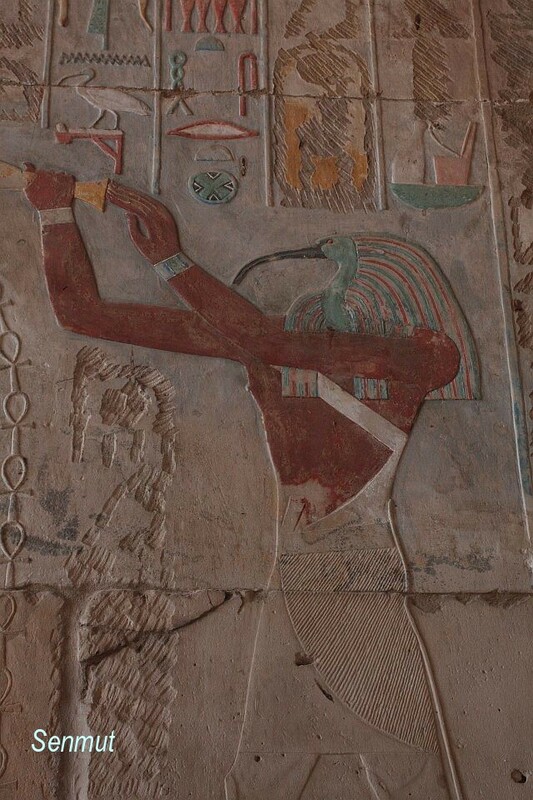 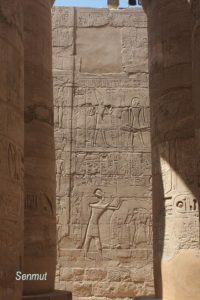 The 7th pylon with scenes of the farao Thutmose III, grandson, smiting his enemies.